Ben Pfaff, Justin Pettit, and Ethan Jackson are core contributors to the Open vSwitch (OVS) project. What’s OVS? 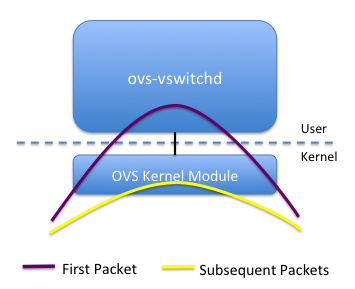 OVS is a virtual switch that’s growing in popularity as an open source vSwitch. The more you dig into open source networking projects, the more you see OVS showing up. One of the OVS gotchas in the past has been performance. But no more. Performance has been boosted to “ludicrous speed,” which means that it’s at least as capable as the Linux bridge, and under many load conditions, blows the Linux bridge away. Packet Pushers co-hosts Ethan Banks and Greg Ferro dig into the topic of OVS performance with the development team that understands the issues the best. We know, we know – you listeners aren’t developers (mostly). We get that, so we try to keep the conversation useful for all our network engineering ears. Why bother with a show like this at all? Software switching isn’t going anywhere, ever. It’s here to stay. The more the network engineering community knows what a software switch like OVS can and can’t do, the better able we’ll be to position it where it should go and use it for what its best at. Now that this performance issue is sorted, the possibilities for OVS just got more interesting. You guys are core contributors – what’s that mean? What sort of networks care about OVS? How does OVS process packets? What about management traffic? How’s that handled? What’s been done to improve performance over the years? What does scale look like in the real world? What are the future priorities? Graphic illustrating OVS flow caching borrowed from Network Heresy. See link below. You might want to read this post on Network Heresy before listening to this show. It’ll help!